With access to millions of royalty free images we'll help you find the right one. Search millions of online images to find the perfect one from within Presbee. Once you've found it, simply drag it onto the stage, and it is ready to edit. Of course if you already have the perfect image simply click upload to make it available. Either way the image will be available for you to use over and over again in your personal image library. Now you've found the perfect image you might need to edit it. Presbee has a built in tool for exactly this purpose. Here you can apply almost limitless permutations of filters and editing functions. You can change the opacity to make the image more transparent or use the sepia function to make it look more old-fashioned. 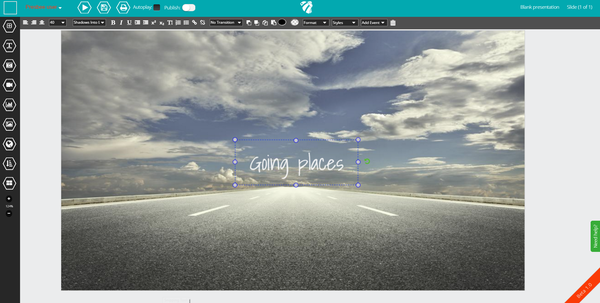 One of the benefits of this is it allows you to grade all your images to have a consistent look throughout the presentation. Now your image is looking perfect, lets add some text. 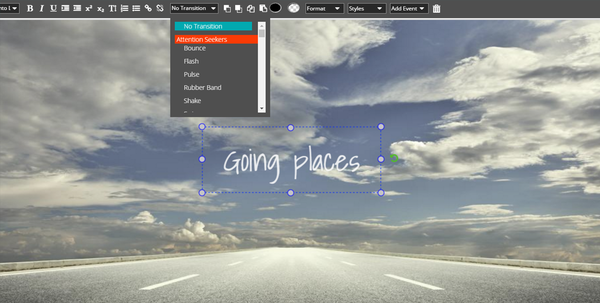 Click on the text tool and a variety of preset text boxes appear. You can choose one of these, or use a blank one and style it yourself. Drag the text box to where you want it on the image, and drop it to place it. 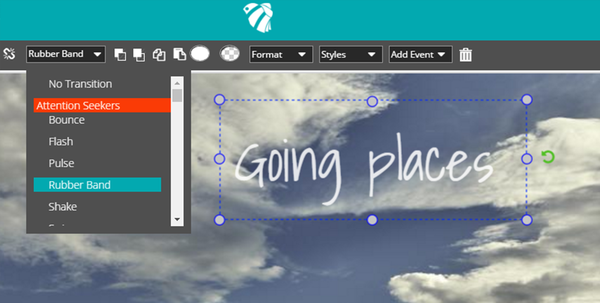 Click on the text box to edit the text and to see style options including font, size, color etc. a word in your shell-like! 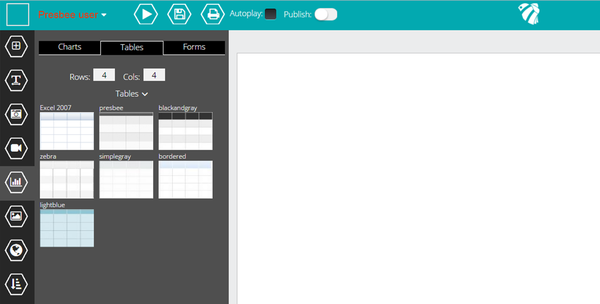 Presbee's text editor allows you to tell your story in your own words in your own style. Our text editing tool has all the functions you'd expect from a powerful text editor with advanced typography settings and access to hundreds of fonts and effects. The intuitive nature of Presbee means that copy, paste, undo etc all use familiar keyboard shortcuts so working from different sources and reformatting is a breeze. The built-in spellchecker allows you to focus on the styling and the transitions of the text for maximum impact. Angle, scale and position your text. Any object on the stage can be rotated, scaled and dragged into the perfect position. Simply click on the object and a control bar will appear around the object along with the appropriate drag handles. You can even manipulate several objects at the same time using the group function. Apply a transition or custom animation to make it all swing. Presbee has loads of really cool transitions but also has several quite unique transitions and effects that are specific to text. If you're trying to make a special point custom animation might be the way to go. Sometimes to really make a point you need to use a transition. Transitions are the way in which something on the stage appears or leaves. We've got all the usual things like fly left, fly right etc but we've also developed many more transitions to help emphasise a point. Some transitions are specific to the content type for example we can make text appear from the top of the screen letter by letter if you like. Whilst transitions are fun - remember less is more - over use can make your audience feel seasick. We also have event based transitions. Sometimes you might only want a set of transitions to happen if a user interacts in a specific way, say by clicking on something. 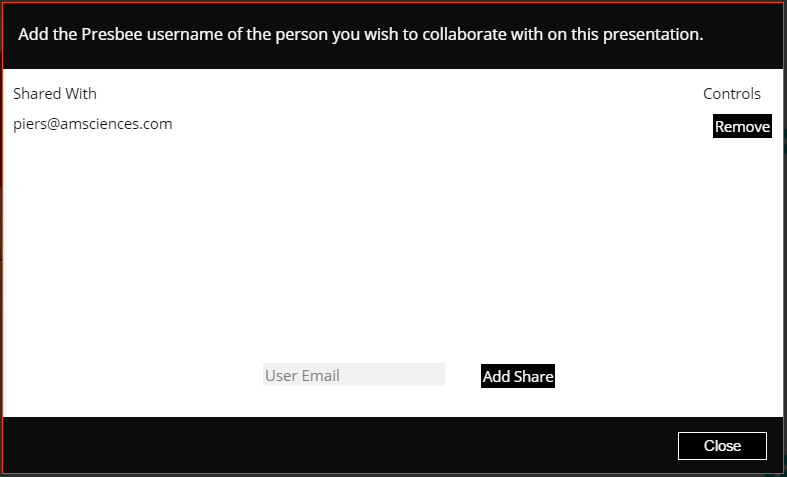 Presbee allows you to create actions in response to user events such as Goto Slide, Pop Outs or Transitions. 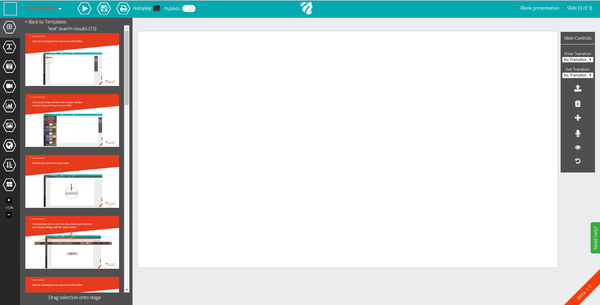 Presbee also has a really powerful tool that allows you to create custom animation events instead of transitions. 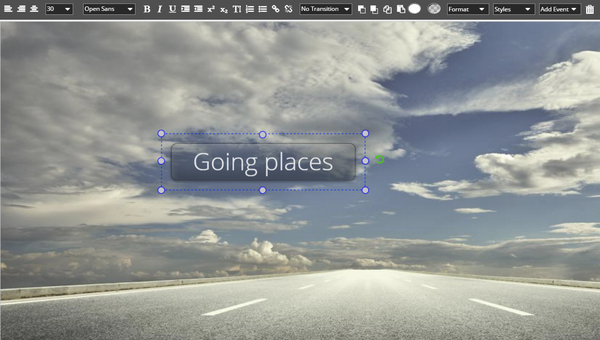 Custom animation builder brings a whole new dimension to telling your story. Animation can not only simplify a complex story it can also demonstrate a simple point in an engaging way. 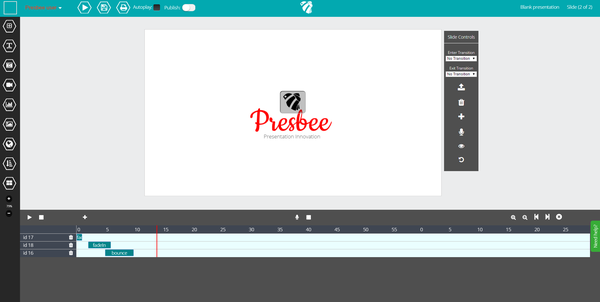 Presbee's animation is a powerful feature that allows the user to have any item on the stage move, show, hide or enlarge as a sequence of events creating animation. 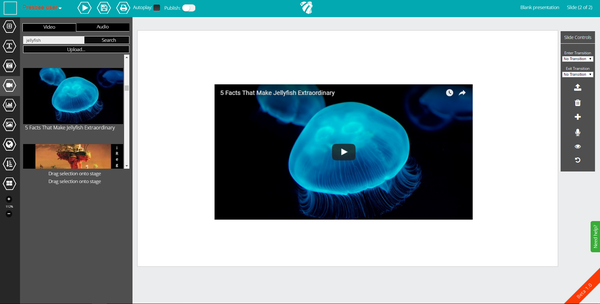 This feature opens up a world of possibilities and has real benefits in education presentations or presentations with complex subject matter. 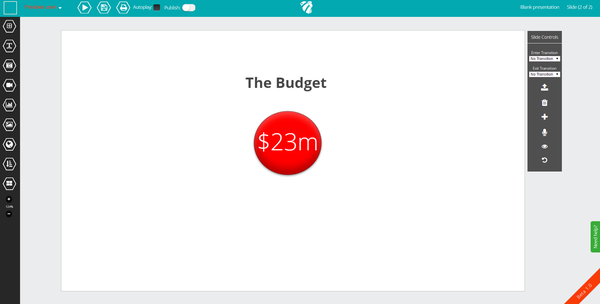 Using animation you might start with the entire budget as a whole (a big circle) and then visually have that whole divide into its sub-categories (smaller cirlces). These parts can be made responsive so clicking on any one of them would break them down further. Creating exciting animation is easy in Presbee. Presbee has a unique animation timeline builder to help you see what any presentation animation would look like as you build it . Whilst this might take a bit more time and thought to put together the results can be spectacular. Video can make a really big impact in a presentation but most tools require you exit them to play videos, or the files must be in a perfect directory structure. With Presbee you simply upload your video or add a YouTube url and we take care of the rest. No waiting for it to load - we stream it when it is required in whatever format is appropriate for the browser. Another feature is the ability to have video run as a background to the stage. 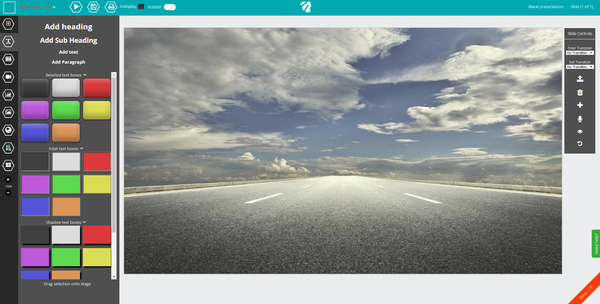 Simply click the 'background' box and it will appear over the full width and height of the screen. Add any audio to your presentation. Simply upload and drag any audio file onto the stage to use it. Whether music, spoken word or SFX audio can add real impact to a presentation. Audio can also 'auto play' so that when the slide appears the sound plays in the background. Sometimes the background plays straight to the forefront of your mind. 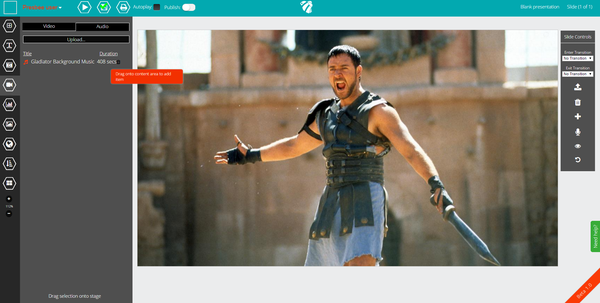 You can use any image or video as a background simply by dragging it onto the stage. 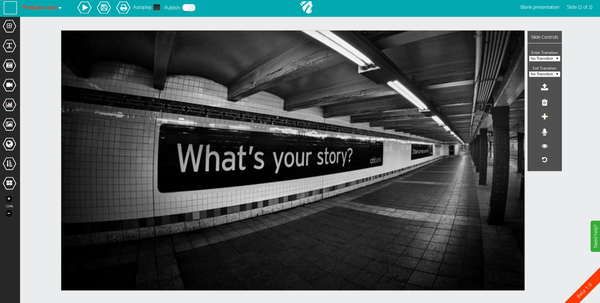 Video backgrounds can be used as a main feature with words simply augmenting it. 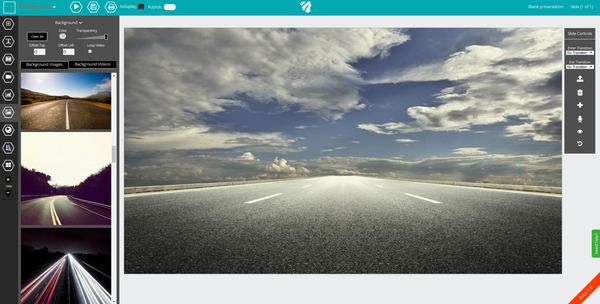 There are several backgrounds provided with each template theme so you can experiment with our ideas as well as your own. 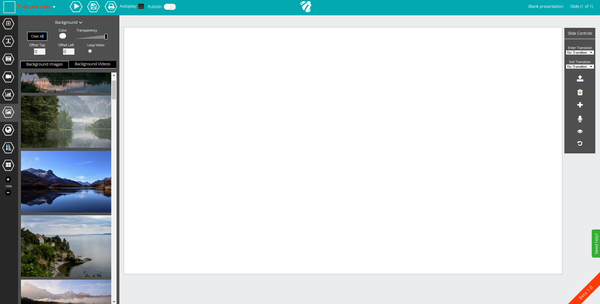 Presbee is good with pictures, words, video and sound - so you'll be pleased to know its just as good with data. We have a variety of pre-styled tables for you to choose from to display your data or you can style your own. We made it simple to copy and paste data between Excel and Presbee too. Which means hopefully you can make the data as interesting as the other parts of the presentation. 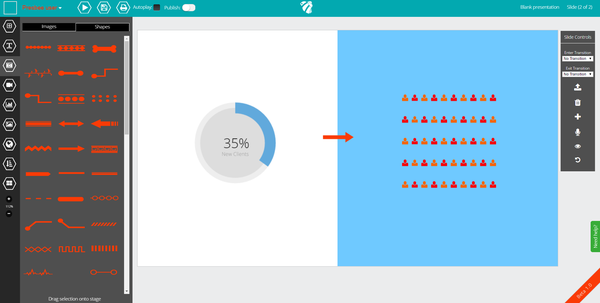 Presbee allows you to create beautiful charts instantly. Just drag the required chart type onto the stage, paste in the data and click 'chart'. Presbee support most of the popular chart types such as line chart, bar chart, pie chart, column chart as well as some cool charts for infographics. Build powerful insightful infographics for your team with Presbee. 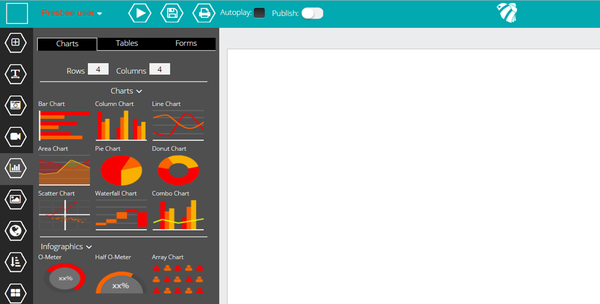 We have O'Meters and Array charts to help you make a graphical display. Need to see an overview of your presentation? Or want to change things around? Presbee has a nice clear slide sorter to do just this. By dragging any slide to a new location you will reposition the slide to that place in the deck maintaining all the associated links to it. Sometimes you'll need a pre-drawn shape. 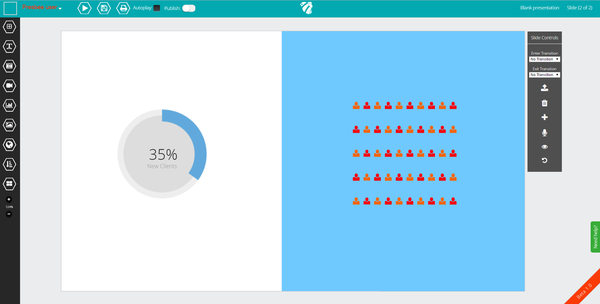 Presbee comes with several shapes and graphics that you can drag onto the stage to use. You can style these anyway you like. So get creative and make it visual. You know what its like...Where is that slide I did for Bob three years ago? Presbee allows you to search your entire library for keywords and see which slides match the criteria. 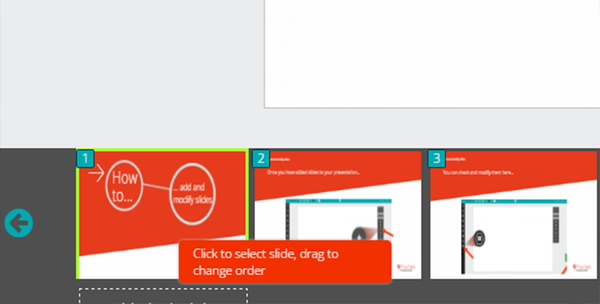 Once found click 'Add' and the slide will appear in your presentation at the current location. That not only saves time but makes your historical work a valuable archive. Full analytics on all presentations whether public or private. With Presbee you can see who looked at your content, how often they viewed it and when they viewed it. This might also be important if you want to follow-up with a client or prospect after knowing that they have actually reviewed your information. 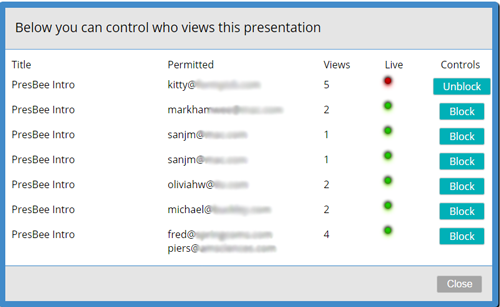 Presbee allows you to give permission (and later revoke it) for others to access and edit a presentation. This is great when a large team is working together.